Very few people payed attention to liquidity premium before the financial meltdown. Liquidity is king. Adding or taking it away literally changes the world, just ask Dr. Ben Bernake. When you are spread trading any financial instrument you must always be aware of liquidity and the risks of being long or short low or high liquidity instruments. Liquidity is a big deal to me, and I had to learn the lesson the hard way. 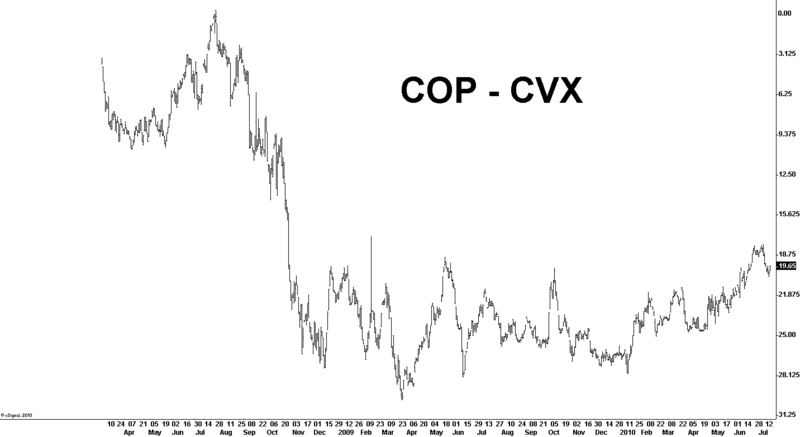 I’m going to use the example of COP, CVX and XOM during the meltdown of late 2008 as my example, because I was in the trade for a short time (long COP and CVX against XOM) and got my face slapped off because I didn’t pay attention to the liquidity risk that existed in the trade. Everything looked good to me when I entered the trades. 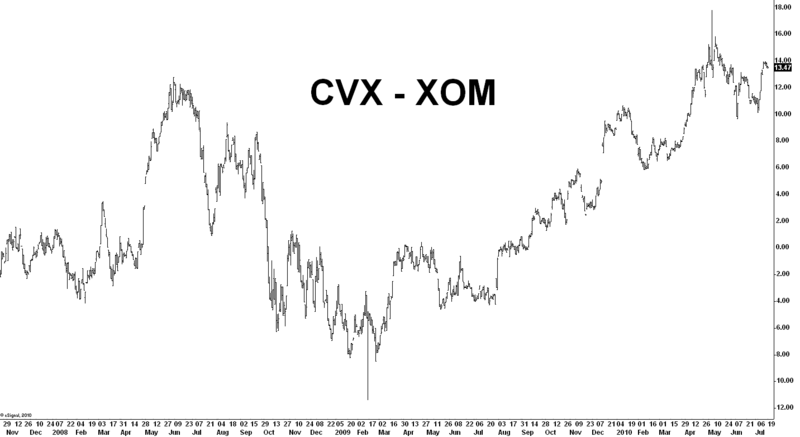 It has a causal relationship, high correlation, few price shocks, and checked many of the other boxes I use to evaluate pairs, but COP and CVX trade half the volume of XOM and we were in the midst of a liquidity crisis. When push comes to shove, and I don’t care what any of the “statistics” like “beta” say, the stock that trades less volume will get killed way faster than the liquid issue in times of stress. It is a fact. When the market went insane-o deleverage-o in the fall of 2008 who got hit the hardest of these major integrated oil and gas companies? The ones with the least liquidity. Yes, COP had its share of problems during the crisis, like rolling over debt when the credit markets were frozen, but all things being equal, total losses were very correlated to the liquidity in the stocks. 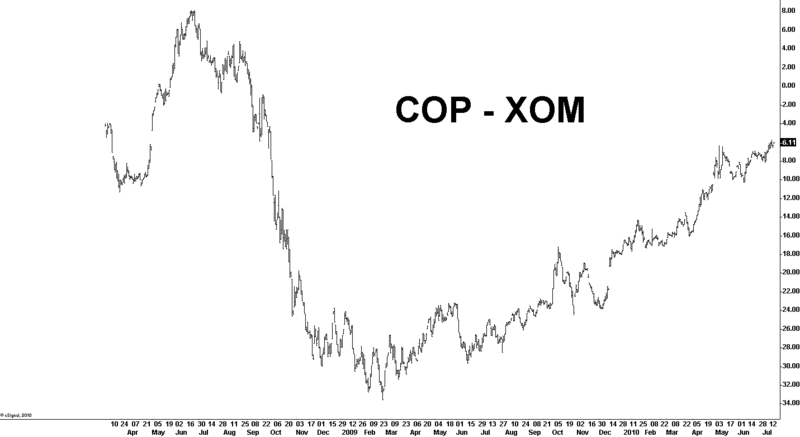 The moral of the story is that based on my calculations XOM has roughly a 8% liquidity premium over its competitors and I did not take this into account when modeling the risk. This was a huge mistake that cost me a lot of money. Liquidity is now an important part of my analysis. Liquidity is not a one-sided affair. In bull markets, stocks with low liquidity and high short interest are subject to big short squeezes. 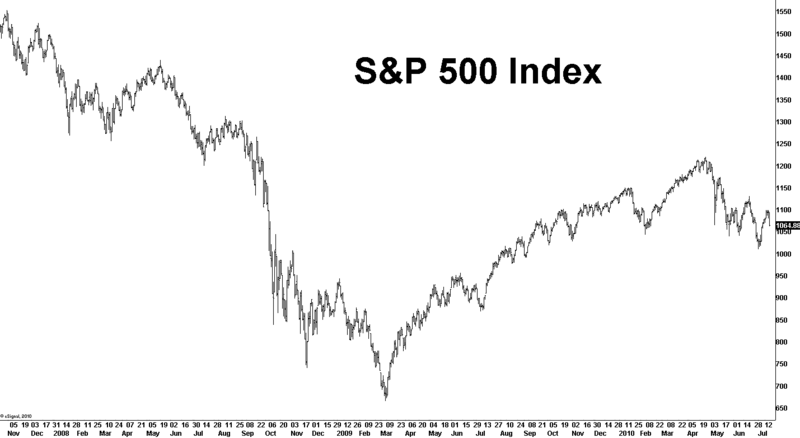 If you are short thinly traded stocks in a bull market you are asking for trouble as well.